But there are other options to the College Credit Plus program. Last month I blogged about the CLEP or College Level Examination Program. Today let's examine the AP program. AP stands for Advanced Placement and is also administered by the College Board. It is a legitimate way of getting college credit in high school. AP is a little different from the CLEP program in that CLEP Prep is more independent study while high schools offer AP courses and AP classes are offered online as well. The student can take one of these courses before sitting for the AP test. However, the course isn't absolutely necessary. If the you are already well versed in a certain subject, you can take the AP test on that subject and if you pass, you get college credit. If your college accepts the AP test results, you just saved yourself a lot of time and money. Unlike CLEP exams, AP exams are only administered on certain dates of the year and you must register at a high school giving the exam to be able to take it. You cannot take AP exams at a testing center. AP also scores on a scale between 1 and 5 with 5 being the best. The AP process is a little more complicated than CLEP. 1. 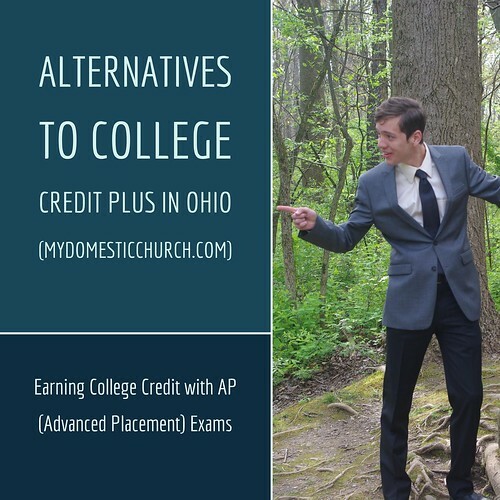 See if the colleges you are interested in accept AP credits. You can do that at the college board here. Just type in the name of the school you are interested in and the site will take you there. Make a special note of the AP exams they accept and the score you need to pass. If they don't accept French I for example, it wouldn't make any sense to send the French I exam to that school. Here is a sample of the exams and scores Walsh University accepts. Note the score you have to have to pass the test. Even at Walsh University there was a variation in what was accepted. For example, a score of 3 would count for credit in English, but 4 was required for World History. 2. Find an AP course. For students going to regular high school this shouldn't be much of a problem. Homeschooled students have some options. An accredited AP course is one that has been approved by the College Board. 3. Keep your eye on the calendar! After the first of the year some deadlines start come up for the AP exam. In January and February is a good time to find the AP coordinator for a high school that offers the AP exam you need to take. You should have that nailed down by March 1. The year Noah took the AP exam in World History, I had a very difficult time finding a place for him to take the test. First of all, it's not a very commonly given exam. When I did find a high school that offered AP World History, most told us that we were not welcome to come there to take the exam because we were not enrolled in their school. We did finally find a place and followed their requirements to the letter - including spending one whole morning there weeks before the exam to go over "exam basics" like bringing a pencil and not being late! Still I was grateful that they allowed him to test there. Homeschoolers need to find a place to take the exam and register as soon as possible because it may be difficult to find a place right away. The tests are typically given the first part of May. 4. Know your subject material. Noah completed his AP course requirements regularly and attended all of the online seminars. I think that helped him to prepare for the examination which he thought was not too hard or too easy. Again we found Instantcert to be invaluable in preparing for the exams. 5. Prepare for the exam. The College Board Site has many good resources for this. It is up to each school to grant credit for the exams. Noah got a qualifying mark of 3 for World History, but Walsh did not accept it. They would have accepted 3 in some of the other courses, but for some reason, not World History. Nonetheless, the knowledge and experience he gained in taking the course and writing the exam were invaluable to his success in making the Dean's list twice in his Freshman year.